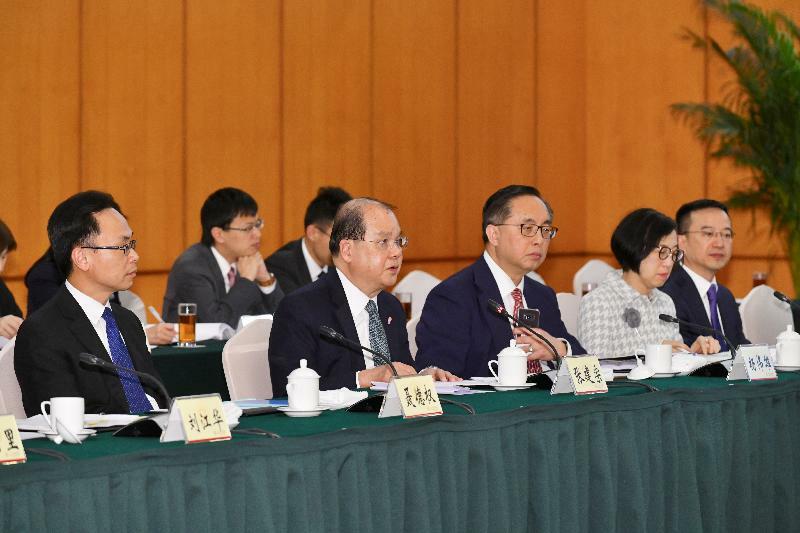 The Chief Secretary for Administration, Mr Matthew Cheung Kin-chung, and the Mayor of the Shenzhen Municipal Government, Mr Chen Rugui, co-chaired the Hong Kong/Shenzhen Co-operation Meeting in Shenzhen today (April 2). 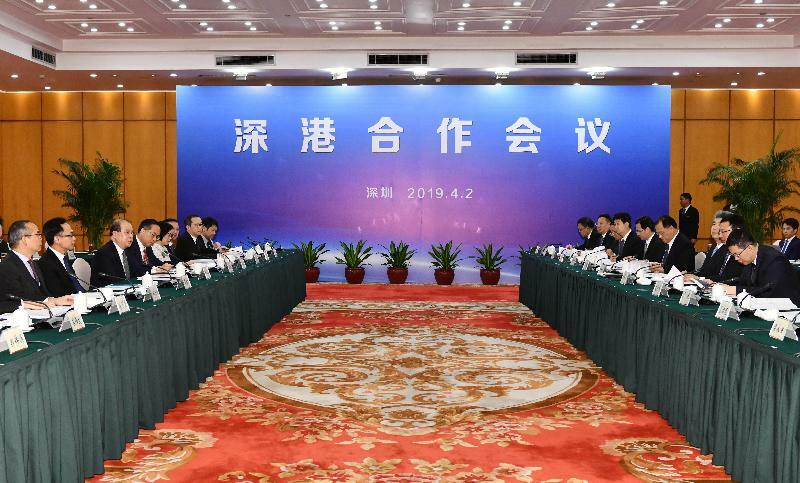 In the meeting, both sides reviewed the achievements made since the last Hong Kong/Shenzhen Co-operation Meeting and set out the directions for co-operation in the coming year. Mr Cheung said, "With the concerted efforts of Hong Kong and Shenzhen, good progress has been made on various areas of co-operation. 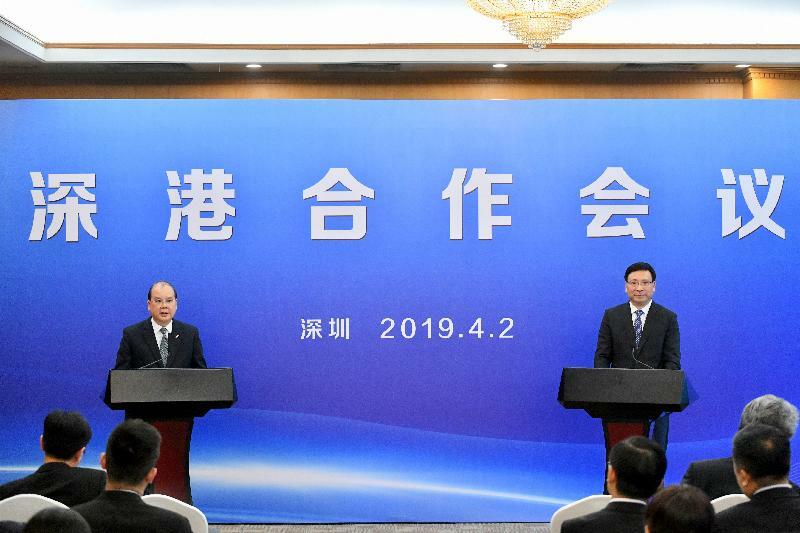 Looking ahead, the Hong Kong Special Administrative Region (HKSAR) Government and Shenzhen will deepen co-operation through participating in the development of the Guangdong-Hong Kong-Macao Greater Bay Area, which is a key national development strategy. The essence of the development of the Greater Bay Area is the commitment of putting things in action and implementation. We will steadfastly take forward initiatives as set out in the Outline Development Plan for the Guangdong-Hong Kong-Macao Greater Bay Area that are pertaining to Hong Kong and Shenzhen co-operation and see through their effective implementation. The goal is to develop the Greater Bay Area into an international innovation and technology hub and an international first-class bay area ideal for living, working and travelling." In respect of individual areas of co-operation, the progress made and directions for future co-operation are outlined below. Hong Kong and Shenzhen have been co-operating closely on innovation and technology (I&T). Both sides are actively developing the Lok Ma Chau Loop into the Hong Kong-Shenzhen Innovation and Technology Park. The Park is one of the key innovation platforms in developing an international I&T hub under the Greater Bay Area development strategy. Situated on an 87-hectare site, the Park will be the biggest I&T platform in Hong Kong's history. Leveraging on Hong Kong's strengths in internationalisation and scientific research, as well as Shenzhen's strengths in I&T and commercialisation, the Park will certainly be able to contribute significant support to I&T development in the Greater Bay Area. It is expected that the first batch of land parcels will be made available by 2021 or earlier for superstructure construction by the Hong Kong-Shenzhen Innovation and Technology Park Limited. The HKSAR Government also supports enhanced co-operation between the Park and the adjacent Shenzhen Innovation and Technology Zone, in an effort to establish a cohesive and synergistic Shenzhen-Hong Kong Innovation and Technology Co-operation Zone, create an internationalised business environment conducive to innovation in the technology industry, and achieve the convenient and effective flow of innovation elements. Both sides will continue to leverage their respective advantages to further promote and strengthen the two places' co-operation in innovation and technology. On cross-boundary Renminbi business, there are 29 banks in Shenzhen that offer joint e-Cheque clearing between Hong Kong and Shenzhen which allow their customers to deposit e-Cheques issued by Hong Kong banks through the online portal. On promoting further co-operation in Hong Kong and Shenzhen securities markets, the daily quota of the Shenzhen-Hong Kong Stock Connect has been quadrupled since May last year. It further promotes the two-way cross-boundary flows of capital. 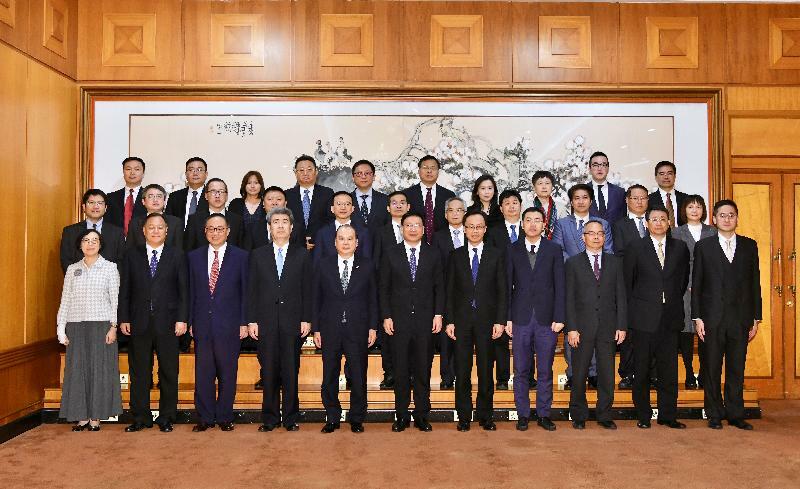 The HKSAR Government and financial regulators are working closely with the Mainland authorities to study and implement financial co-operation initiatives in the Greater Bay Area, especially those facilitation measures relating to people's livelihood, and have attained initial progress on this front. In the coming year, we will continue to explore a host of financial facilitation measures relating to individuals, enterprises and financial institutions, with a view to promoting the efficient flow of capital in the Greater Bay Area. For construction and related engineering sectors, the number of Qianhai pilot projects adopting Hong Kong construction management systems has been increased from two to six. Among them, five pilot projects have already commenced and are in good progress. The HKSAR Government hopes that the Qianhai Management Authority will continue to increase the number of pilot projects. For legal services, 11 partnership associations between Hong Kong and Mainland law firms have been set up and seven of these are set up in Qianhai. In December last year, the Greater Bay Area Research Base on Establishment of Rule of Law of the Ministry of Justice was launched in Shenzhen, aiming to create a high-end legal think tank in the Greater Bay Area. The HKSAR Government will continue to encourage the legal services sectors of both places to enhance co-operation in order to achieve greater synergy. On youth co-operation, the Chief Executive announced in her 2018 Policy Address that the Government would make an injection to the Youth Development Fund (YDF) to further support youth innovation and entrepreneurship. In this connection, the Home Affairs Bureau has collaborated with the Hong Kong United Youth Association (HKUYA) since the end of 2018 for the HKUYA to utilise its own resources to roll out a pilot scheme to encourage Hong Kong youth entrepreneurs to settle in three youth innovation and entrepreneurial bases in Shenzhen. Making reference to the experience obtained from the pilot scheme, the Youth Development Commission launched in March this year two new funding schemes under the YDF, namely the Funding Scheme for Youth Entrepreneurship in the Guangdong-Hong Kong-Macao Greater Bay Area and the Funding Scheme for Experiential Programmes at Innovation and Entrepreneurial Bases in the Guangdong-Hong Kong-Macao Greater Bay Area. In the future, both parties will strengthen co-operation, jointly encourage Hong Kong young people to start their business in Shenzhen, provide them with more development opportunities, and support and encourage them to participate in the development of the Greater Bay Area. It is anticipated that with support from the HKSAR and Guangdong governments, an Alliance of Hong Kong Youth Innovative and Entrepreneurial Bases in the Greater Bay Area will be established within 2020, with a view to providing a one-stop information, publicity and exchange platform that is premised upon non-governmental organisations (NGOs) and youth innovation and entrepreneurial bases in the Greater Bay Area. Moreover, the HKSAR Government continues to subsidise NGOs to provide exchange and internship opportunities in the Mainland for Hong Kong young people through the Funding Scheme for Youth Internship in the Mainland and the Funding Scheme for Youth Exchange in the Mainland. In 2018/19, around 450 and 1 500 Hong Kong young people participated in internship and exchange programmes in Shenzhen under the two funding schemes respectively. In the past year, the Qianhai Management Authority has continued to vigorously promote the participation of Hong Kong people and enterprises in the development of Qianhai. Since the beginning of its land sale in 2013, sites capable of providing a total gross floor area of about 2.94 million square metres have been sold to Hong Kong-invested enterprises. 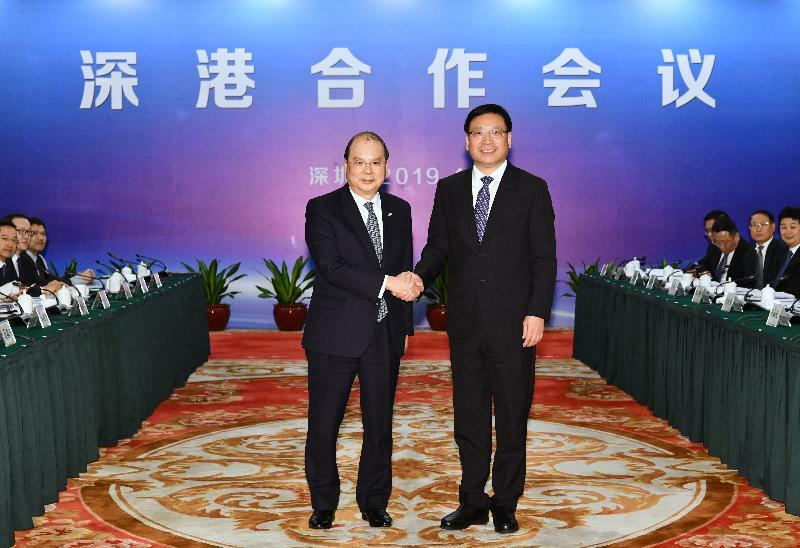 As at the end of February 2019, over 11 000 Hong Kong-invested enterprises have registered in the Qianhai and Shekou Area of the Guangdong Pilot Free Trade Zone. The target of attracting 10 000 Hong Kong-invested enterprises to set up bases there has been accomplished earlier than planned. The HKSAR Government will dovetail with the Shenzhen authorities to put forward the "Ten Thousand, Thousand, Hundred and Ten" development target by 2020 as set out in the "Work Plan on Promoting Shenzhen-Hong Kong Co-operation in the Shenzhen-Hong Kong Modern Service Industry Co-operation Zone in Qianhai", with a view to expanding the space for development for Hong Kong people and enterprises. The Heung Yuen Wai Boundary Control Point (BCP) project is in progress. The new land port will link eastern Hong Kong with eastern Shenzhen, such as Longgang District. By then, the anticipated average travelling time between Tai Po in Hong Kong and Longgang in Shenzhen would be reduced from about 53 minutes to about 31 minutes, facilitating smooth and efficient people and cargo flows across the boundary and enhancing the "one-hour living circle" in the Greater Bay Area, which are of strategic importance to Hong Kong's long-term economic development. The HKSAR Government is striving to complete the construction of the new BCP this year for early commissioning of the new BCP. Apart from the above, Hong Kong and Shenzhen have also made steady progress in other areas of co-operation such as tourism, education, creative industries, environmental protection, livelihood, culture and medical services. Officials accompanying the Chief Secretary for Administration in attending the meeting included the Secretary for Constitutional and Mainland Affairs, Mr Patrick Nip; the Secretary for Innovation and Technology, Mr Nicholas W Yang; the Secretary for Home Affairs, Mr Lau Kong-wah; the Secretary for Food and Health, Professor Sophia Chan; the Acting Secretary for Commerce and Economic Development, Dr Bernard Chan; the Under Secretary for Constitutional and Mainland Affairs, Mr Andy Chan; the Under Secretary for Transport and Housing, Dr Raymond So Wai-man; and other representatives of the relevant bureaux.